What is Glucose Made Of? 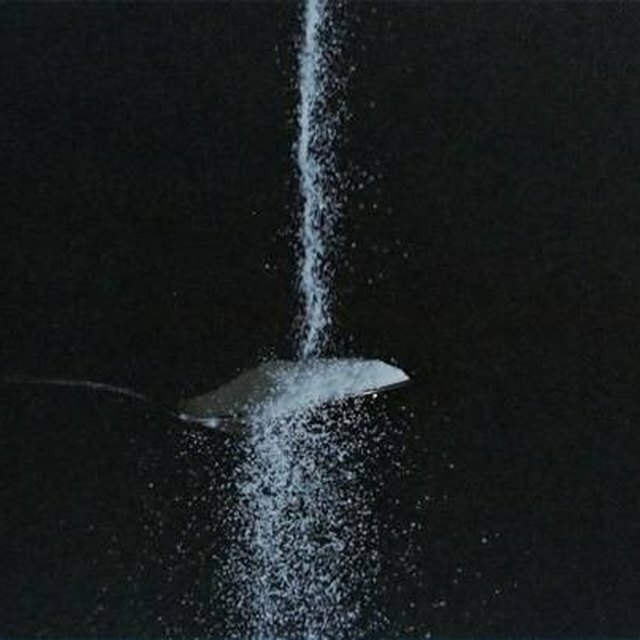 While sugar and salt may look similar, they are quite different. Various sugars are naturally occurring, but the term “sugar” usually refers to sucrose, which is a disaccharide made of glucose and fructose. Similarly, there are many different kinds of salt, but the word “salt” usually refers to table salt, which is a lattice structure of sodium and chloride ions held together by hydrogen bonds. The chemical formula of sucrose is C12H22O11, meaning that each molecule of sucrose has 12 carbon atoms, 22 hydrogen atoms and 11 oxygen atoms. The atoms come from one monomer of glucose plus one monomer of fructose. These two monosaccharides are connected by a glycosidic bond. The chemical formula for table salt, otherwise known as sodium chloride, is NaCl. Knowing that sodium chloride is a salt as opposed to a molecule like sucrose, this chemical formula tells us that table salt is a lattice structure composed of sodium cations and chloride anions arranged in a 1:1 ratio. Sodium chloride is held together by hydrogen bonds as opposed to molecular bonds. The main sources of sucrose are sugar cane and sugar beet. Other sources include sugar maples and sorghum. The primary sources of table salt are brine and naturally occurring rock salt, which is also known as halite. The United States is the largest producer of sodium chloride. Both sucrose and salt are used for human consumption. We are hardwired to like the taste of sweet and salty foods because our bodies need sugars and salts to survive. Like most carbohydrates, sucrose contains a lot of energy stored in its molecular bonds. Our bodies are able to break down sucrose and release this energy. When we eat salt, it naturally dissolves into sodium and chloride. Sodium chloride can also be useful in industry, as many industrial products require chlorine. While our bodies certainly need sugar and salt, too much of a good thing can be unhealthy. Consuming too much sugar can lead to tooth decay because the bacteria that live on the surfaces of our teeth metabolize sugar in such a way as to produce an acidic by-product. This acid breaks down the enamel in our teeth. Because sucrose contains so much energy, over-consumption of it can lead to weight gain. Over-consumption of salt can lead to high blood pressure, fluid retention and certain metabolic disturbances. Tutor, Sly. "The Differences Between Salt & Sugar." Sciencing, https://sciencing.com/differences-between-salt-sugar-8198110.html. 13 March 2018. Why Is Salt Water Heavier Than Tap Water?